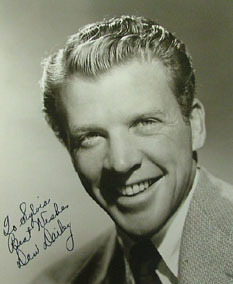 Dan Dailey began his career in the last days of vaudeville, and in 1934 he was cast in a minor part in the Rodgers & Hart musical, Babes in Arms. That play ran on Broadway for its final year, 1937. He obtained roles in several more plays, until 1940 when he signed a contract with MGM. The studio immediately miscast Dailey, a song and dance man, as a Nazi in The Mortal Storm. World War II interrupted his career, as well as a succession of B movies. He switched studios, to 20th Century Fox. The year 1947 saw him in Mother Wore Tights, alongside Betty Grable. His appearance with her in When My Baby Smiles at Me the following year earned him an Academy Award nomination. A leading man in the 1950s, his career slowed in the 1970s. In 1969 and 1970 he starred as Gov. Drinkwater in The Governor & J.J., after which he continued to take roles on both stage and screen. In 1977 he broke his hip and had an artificial replacement put in, but the new hip became infected. He disdained hospital treatment and anemia caught up with him. Dailey died at his home in Los Angeles from that ailment in October 1978.